On Sunday, I took part in my first multi-discipline event- an Aquathlon organised by my triathlon club Havering Tri and another local club Spartan Tri. The event was a good way for me to ease into multi-sport events, as it just involved a swim and a run- as I don’t have a decent bike yet I didn’t need to worry about the cycle! I met up with the ladies from my tri club- Laura, Amy and Nikki, plus our swimming coach Kay. We collected our race bibs, had our numbers written on our arms and waited for the briefing. The Aquathlon was also for children aged 8 upwards, so we watched the youngsters compete while we waited for the adult’s heats. They were amazingly speedy, and it was great to see kids getting involved with sports as I did nothing like this when I was their age! I was incredibly nervous about this event, much more so that any running race I’ve ever taken part in. I was anxious that my calf would cramp up during the swim, I was nervous that I would fall over after getting out of the pool and I was unsure about how it would feel to run in a wet trisuit. Watching the kids swim made me even more nervous! The adult ladies heat was the 9th wave of the day, I was assigned a lane next to Laura, Amy a lady called Becky who was from another club, I slid into the pool and awaited the off. The 400m swim was 16 lengths of the 25 metre pool. I got off to a good start- the first thing I noticed was how clear the water was! The pool I usually train in is murky and misty, but in this pool I could clearly see the bottom! I completed 10 lengths of front-crawl, before switching to breast-stroke for lengths 11 and 12, then back to front-crawl for my final 4 lengths. I did pause a few times between lengths to catch my breath. As I expected the other 3 ladies were speedy and I was the last to finish the swim, but I was proud of my time considering I could barely swim at all when I started lessons last June! The spectators clapped and cheered me on as I carried on with my last few lengths and I finished the 400m swim in 10:26. I hoisted myself out of the pool and jogged outside to the transition area. I’d laid out my T-shirt (with race number attached), trainers, socks, Tom Tom watch, water bottle and towel before the race started. 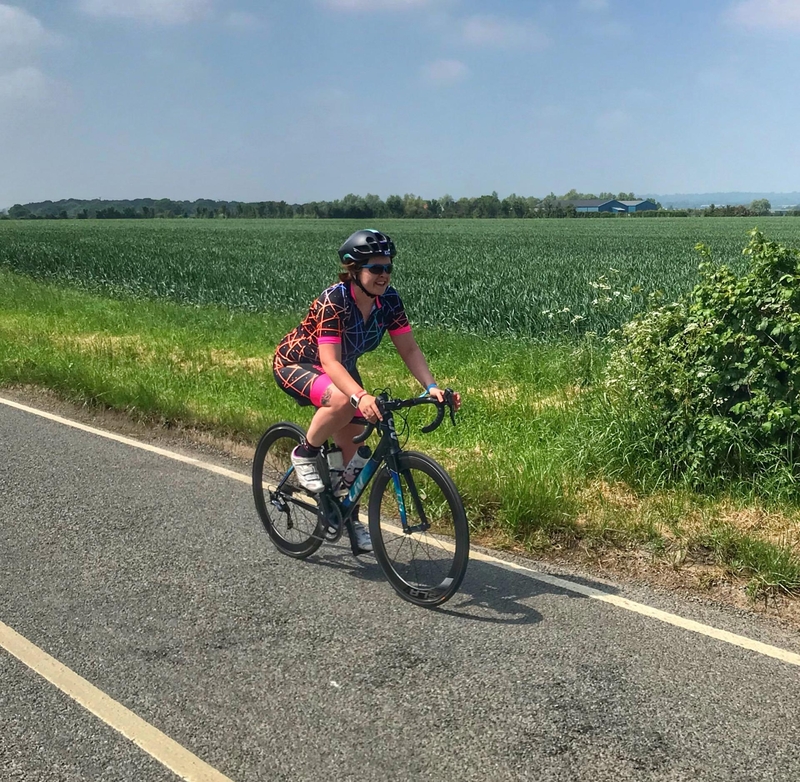 I’d used Jen‘s tip of using a brightly coloured towel to help find my area quickly and easily- but it wasn’t completely necessary as my kit was the only one left in transition! I whipped off my swimming hat and goggles, threw on my T-shirt, socks and trainers, turned on my Tom Tom and headed off for the run. The 3 mile run was 8 laps of the school field. It was a blustery day, and as the wind whipped across the field I immediately realised how uncomfortable it was to run in a soaking wet trisuit! Glen was there to cheer me on and take photos which was lovely! I must admit I felt self-conscious of my legs in my tight tri-suit as I’ve never ran in shorts before. I slowed down a few times to yank down the legs of the suit, but looking at the photos now I don’t think I look half as bad as I had imagined! The padded crotch also felt strange, and I needed to adjust that as I ran! It did feel like I was wearing a wet nappy! The 3 miles felt the longest ever- usually this distance is no big deal, but after the swim it felt as though I was running a marathon! I thought of my Blogger/Twitter friends who actually were running a marathon (Paris/Manchester/Brighton) and pushed on with my 3 miles! The marshalls counted down the laps, and when I was on my 7th lap I was overtaken by Amy who was finishing her final lap. We chatted for a few seconds before she sped off to finish. I finished with a sprint and collected my water and Power Bar- I had expected a medal but it seemed that there was no bling at this event. I had a splitting headache and I was freezing cold as soon as I crossed the line- but it soon passed once I’d changed out of my wet kit. My official time for the 3 mile run was 30:28 (but the time on my Tom Tom was 28:59, so I assume this includes 1:29 in transition). My overall time was 40:54, meaning I came 12th out of 15 adult competitors and 4th out of 5 ladies. Not too bad! -I need to bring two towels as mine was filthy from being on the floor in transition, so it was difficult to dry myself afterwards! -Running in a wet trisuit is never going to be comfortable, but thankfully the run was over quickly! -Wearing a sports bra under my trisuit was a good call! -Not to waste time adjusting the legs of my suit, as my thighs are not that bad!